Published: June 13, 2013 at 03:47 p.m. Updated: June 14, 2013 at 04:50 p.m. 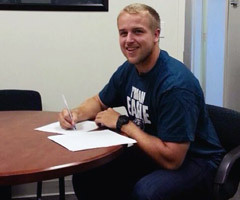 When it comes to Matt Barkley, the Philadelphia Eagles are putting a ring on it. The Eagles on Thursday agreed to terms on a four-year contract with the former USC quarterback, according to the team's official website. The Eagles nabbed Barkley in the fourth round of April's draft, plugging him into a jam-packed quarterback room that includes Michael Vick, Nick Foles, Dennis Dixon and the unsung G.J. Kinne. Barkley isn't expected to win a starting role, but new coach Chip Kelly intends to give all his signal-callers an opportunity to earn the job. Dixon, who crossed paths with Kelly at Oregon, offered some ill news for Vick, who moaned earlier this month about the drawn-out quarterback competition. "It will be as long as you imagine. That's what Chip Kelly is," Dixon told the team's official site this week. "He keeps everyone on their toes. As an athlete, you have to be ready. Whenever your name is called, you have to be ready." For Barkley, getting the financials out of the way as soon as possible is wise.